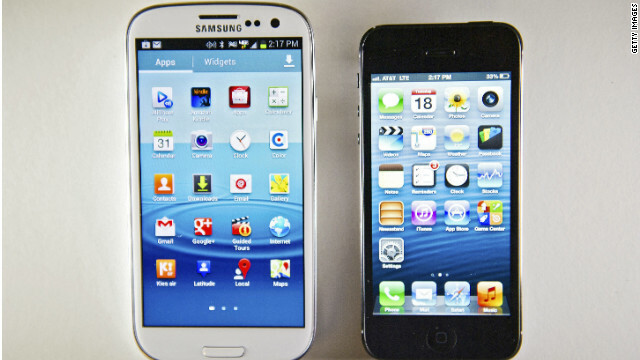 The Samsung Galaxy S III smartphone, left, beside its new rival, the iPhone 5. For years tech pundits have been searching for an "iPhone" killer -- a mythical new device that would dethrone Apple's mighty handset as the most admired or popular smartphone. It may be already here. For the first time, Samsung's Galaxy S III overtook Apple's iPhone 4S to become the world's best-selling smartphone model for the third quarter (July through September) of 2012, according to new research by Strategy Analytics. The Galaxy S III shipped 18 million units worldwide, compared with 16.2 million for the iPhone 4S. That's 11% of all smartphones shipped on the planet. Yes, this is the phone in those mocking TV ads that show annoying fanboys and fangirls in a thinly disguised Apple store line, obsessing over their impending purchase while a happy Galaxy S III owner saves a place in line ... for his parents. Released in May, the Android-based Galaxy S III boasts a bigger touchscreen and longer battery life than the iPhone 4S, along with more megapixels in its camera and the ability to run on 4G cellular networks. Some tech sites have rated it the best smartphone on the market. But the Galaxy S III reign atop the sales rankings will likely be short-lived. As Strategy Analytics pointed out, iPhone 4S sales waned in the third quarter as consumers waited for the iPhone 5, which went on sale September 21. Apple sold 5 million iPhone 5s that first weekend and is expected to sell many millions more during this holiday shopping season. Well... I picked up the Galaxy III in August and I must say that I like it very much... I bought the iPhone 4S for my wife at the same time and she also seems to like it. The Galaxy does pretty much everything that I want to it to do, however anyone who has one will notice the reduced battery life..
Samsung has acknowledged this problem and there is a simple fix that should increase batter life... I have done these changes in the settings and it has seemed to help.. Here are the steps for those who wish to try..
1... From the top of home screen, pull down settings... Do Not use Auto-Brightness, if the box is checked off, Uncheck and then Set your desired level and keep it there. In the end, it all depends on what you need and want the phone to do and I believe you cannot go wrong with either product..